As you can see, the artwork was appropriately cartoonish and quite clever in many places. I loved how it was a combination of iconography and comic conventions and also how it balanced storytelling with joking. The dialogue and pacing in the excerpt give an accurate picture of the tone of the entire book. Many of the events seem surreal and hilarious, but they are also reflective of the superhuman flaws and personalities of the gods themselves. They mess up continually, feud, and allow themselves to be ruled haphazardly. Still, despite the capriciousness and hilarity, there is an element of sincerity and depth that especially arises in the book's ending. 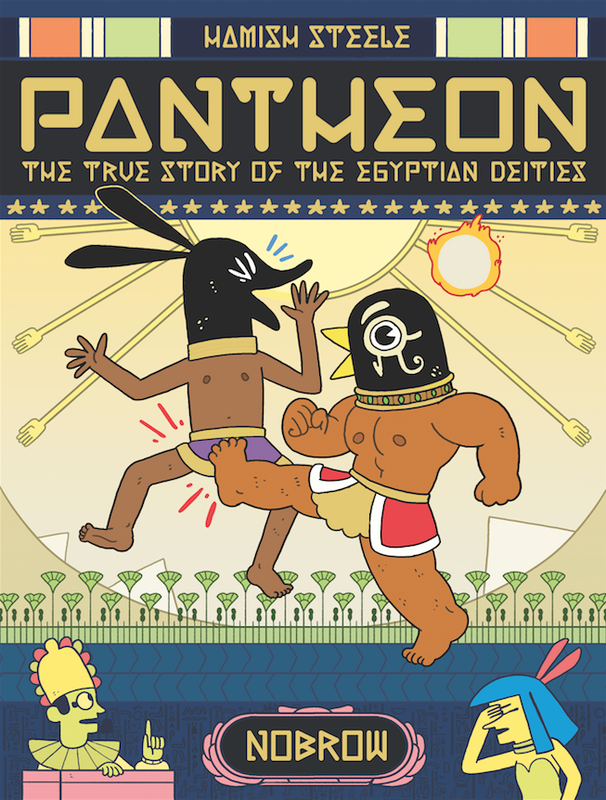 Before reading it, I had a passing knowledge of the Egyptian pantheon, but I feel that I learned much more here. I also got a good number of laughs from it, which was a huge bonus. Pantheon is the work of Hamish Steele. It is his debut graphic novel, and he got funding for its initial version via a Kickstarter campaign. He also works on a biweekly webcomic called Deadendia. All of the reviews I have read about this book have been celebratory. Publishers Weekly wrote, "After the parade of slapstick and gross sexuality that comes before it, it’s a surprising conclusion that makes the ancient stories feel relevant and alive." Joe Gordon called it "an utter, cheeky delight." 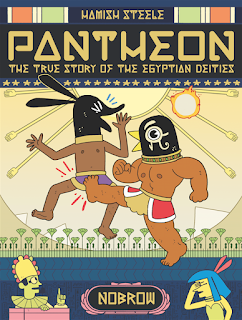 James Smart opined, "This take on ancient Egypt is educational as well as hilarious." Kevin Harkins called it "one of the cleverest ideas I have seen in a while." Parenthood changes a person, and it is the framing sequence of The Best We Could Do, a complex, heartfelt, and evocative book that touches on family, history, and humanity. The initial scenes from a hospital precipitate everything that follows, and this book touches on a great number of serious topics. It looks at relationships with parents, but it also puts her specific relationship into context by delving into their pasts. Along the way, we are privy to their formative years in Vietnam, get to know about their families and their hopes and aspirations, and then see how life played out. Like the narrative throughout the book, these depictions are presented in non-linear, rich, and human fashion. The parents' lives are not simple hero narratives, but shown to be full of tragedies, triumphs, luck, routines, patterns, and stamina. Also, the setting of this book shows the effects of colonialism on a country, the effects of war, the travails of being a refugee, and the discomforts that come from being an immigrant. This last set of concerns is especially topical right now, as we see similar situations over the world, with there being a dehumanizing and hateful backlash to people trying to find a place in the world. This book puts a much needed human face on such circumstances without resorting to simple good/bad narratives. The simple, sparse artwork tells a strong story with a devastating economy. Several simple juxtapositions communicate volumes, such as drawing a country to be a person's spine or seeing a mother's pained face in the delivery room where her daughter is about to give birth. These simple features belie complicated pasts and relationships in a few strokes, and the muted colors and stark figures add much affect in surprisingly powerful fashion. I did not know what to expect when I started this book, but I loved it. 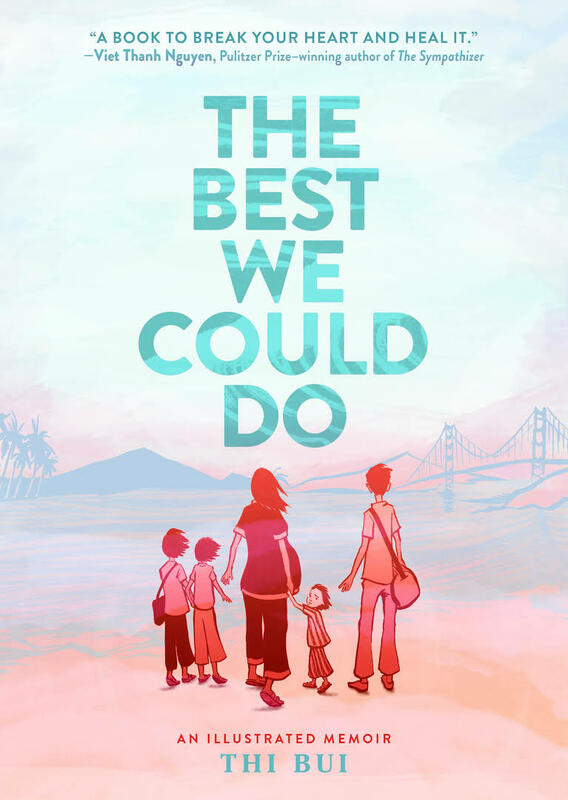 As a parent and a son of immigrants (though not ones from such plights as the ones here), I found much to relate to, sympathize with, and ponder in this beautifully and intricately rendered book. Thi Bui created this book over the course of many years, beginning it from her thesis project on her family's oral history. 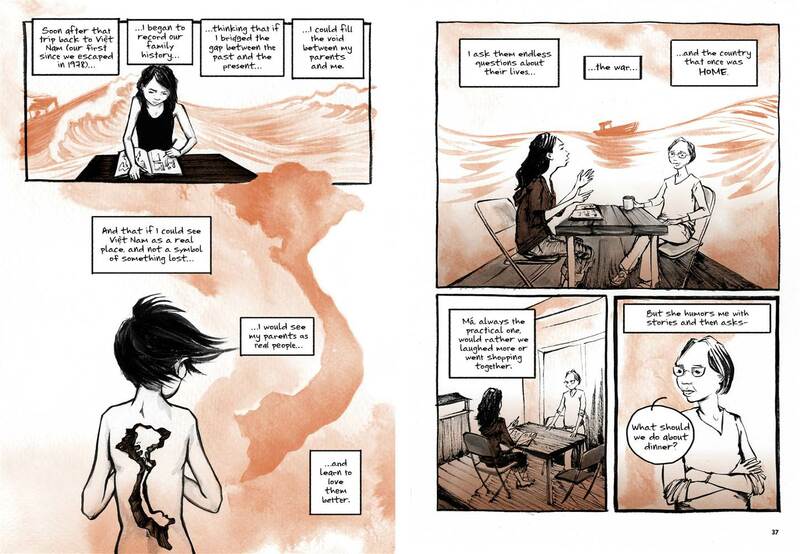 She teaches high school, and this book is her debut graphic novel. She speaks about her work on it and much more in this interview. All of the reviews I have read of this book have been glowing. Robert Kirby called it "an important, wise, and loving book." Publishers Weekly gave it a starred review and wrote, "In excavating her family’s trauma through these brief, luminous glimpses, Bui transmutes the base metal of war and struggle into gold." 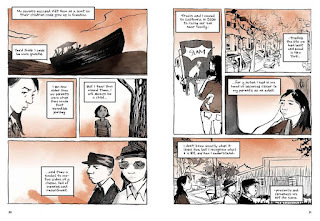 John McMurtie noted that "Bui’s memoir elicits complex emotions from understated pen-and-ink drawings." 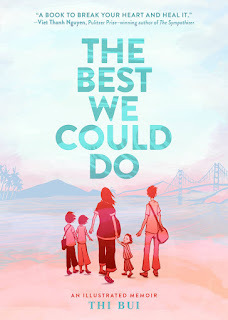 The Best We Could Do was published by Abrams ComicArts, and they have a preview and much more information about the book here. There is also another lengthy preview from PEN America. Social media made me read this book. I follow this book's author on Instagram and also saw a shout-out to this book on Twitter from one of my friends, so I thought I would check it out. First off, let me say that it is not a traditional graphic novel in terms of telling a single narrative. It is more like a collection of chapters that revolve around and extend specific themes. So what I am saying is that this book is full of chapters that operate like pieces of jazz music, with comics riffing on motifs. And each comic is a meticulously constructed gem. This is not a book to plow through but one to bask in and savor. 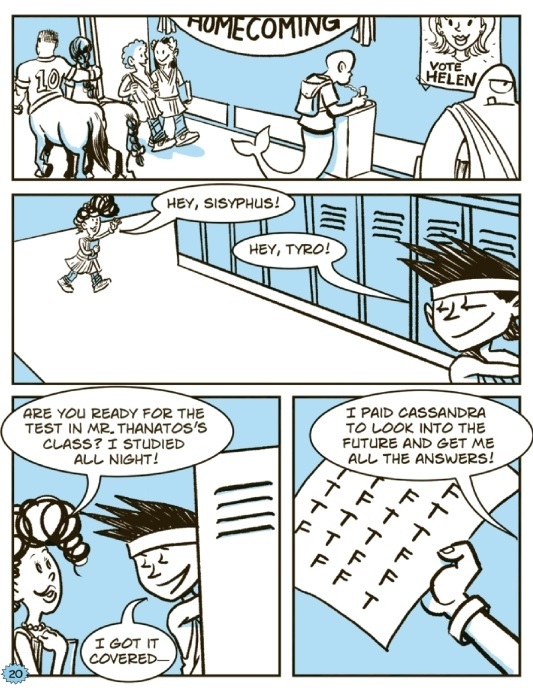 As you can see from the excerpt, these comics are clever and cerebral. 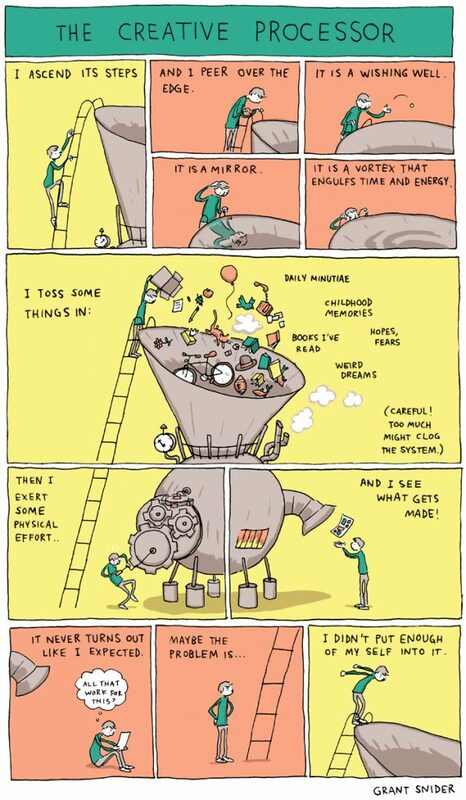 The artwork is colorful and clear, slightly reminiscent of Tom Gauld's style (to me at least), which I feel is a wonderful thing. I loved this book's playful, inventive qualities, and I feel that it has much to offer in terms of inspiration, advice, or understanding for aspiring artists or those who appreciate the arts. A few of the entries may seem redundant, but most are noteworthy and unique. And there were quite a few sections that I felt were phenomenally well executed. There are far more hits than misses in this book. 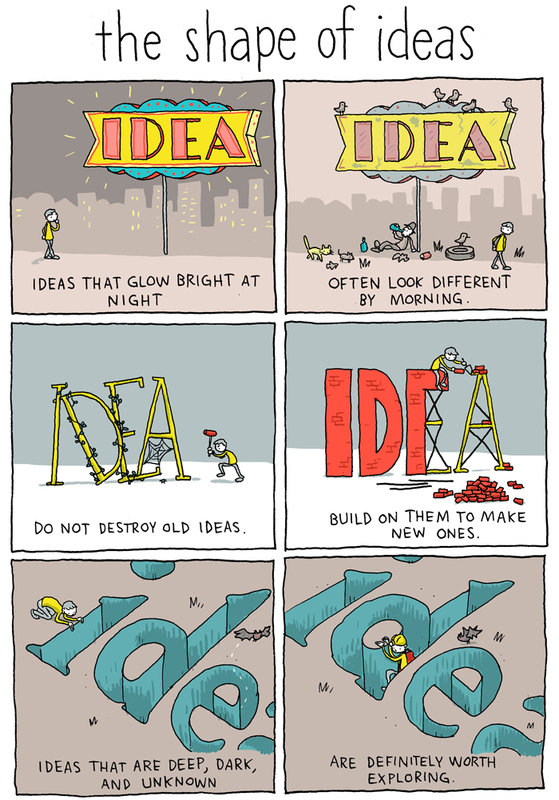 The man behind this book, Grant Snider is an orthodontist by trade and also well known for creating Incidental Comics. 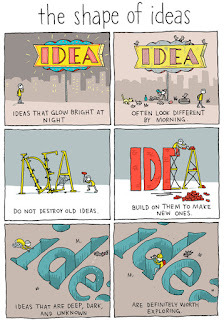 His work has appeared online and also in many prominent venues like The New Yorker and The New York Times Book Review. He speaks about his work on this book and in general in this interview. All of the reviews I have read of this book have been positive. Publishers Weekly summed up, "The tongue-in-cheek wit and self-deprecating style make this a pleasant introduction to the joy and frustration of making any kind of art, and the beautifully designed presentation—with a charming die-cut cover—is a fine proof of concept." 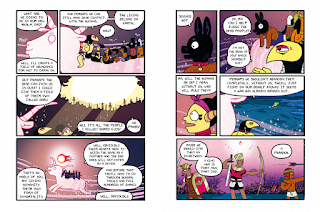 Andrew Jarman called it an "incredibly unique and wonderful graphic novel that I absolutely loved." 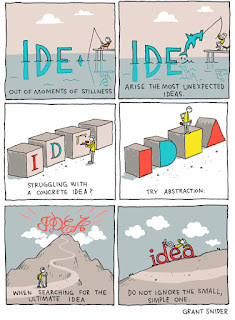 Kevin wrote, "While there is some repetition of ideas here, Snider’s exploration of the creative mind through comics and graphics will surely make you contemplate the wistfulness of creativity, and perhaps inspire you to make your own." 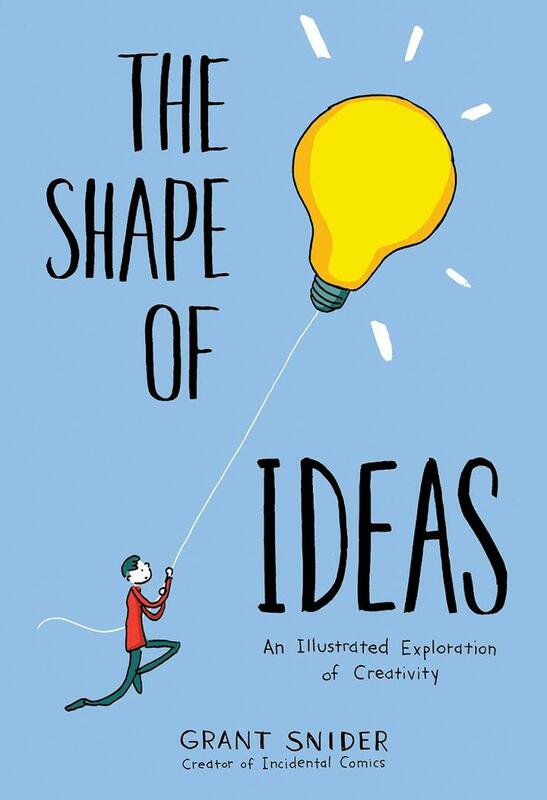 The Shape of Ideas was published by Abrams ComicArts, and they have a preview and more information available here. 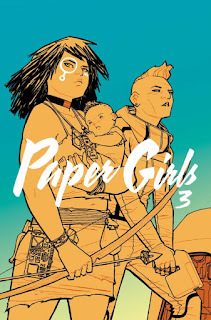 Today, I look at the next two installments in the Paper Girls series (my review of Volume 1 is here). These two trade paperbacks cover issues 6-10 and 11-15, and the fact that I read both may spoil the fact that I found much here to keep me entertained and involved with this title.Still, won't you stick around and see what I thought about each in detail? Volume 2 takes the girls 28 years into the future to 2016. There, at least one of them runs into her future ("old") self, and they all search for the lost member of their quartet. Along the way, a few more clues about who are chasing them get dropped, though much is still left unanswered. Mostly, the girls find out that they can't always trust everyone (even other versions of themselves) and learn about "foldings," times and places that line up just right to allow time travel to happen. Each chapter in this volume ends with a revelation, and the ending cliffhanger was a good one. My favorite part of this volume, apart from the excellent artwork, continues to be the clever dialogue and relationships between the girls. They might not be the closest of friends, but they do get along in their own ways. And they are biting and swift in their judgments. Also, there are a bunch of jokes in their observations of future life that I thought were funny. Overall, it was a pretty brisk, fun book that left me wanting more. Luckily, Volume 3 just came out so I did not have to wait to see what progressed. In this book, the girls end up in about 10,000 BC, a prehistoric period when people are pretty primitive and rough. The quartet meet a young woman, her baby, and three men who want to steal that baby away. Also, they also meet up with another time traveler who fills in some more information about what may be happening. This installment is more action-packed, with lots of disappearances, chases, large animals, and combat with stone weapons. And I quite enjoy seeing how each of the different volumes is set in a different historical epoch and has its unique flavor. In the end, I enjoyed reading these books. 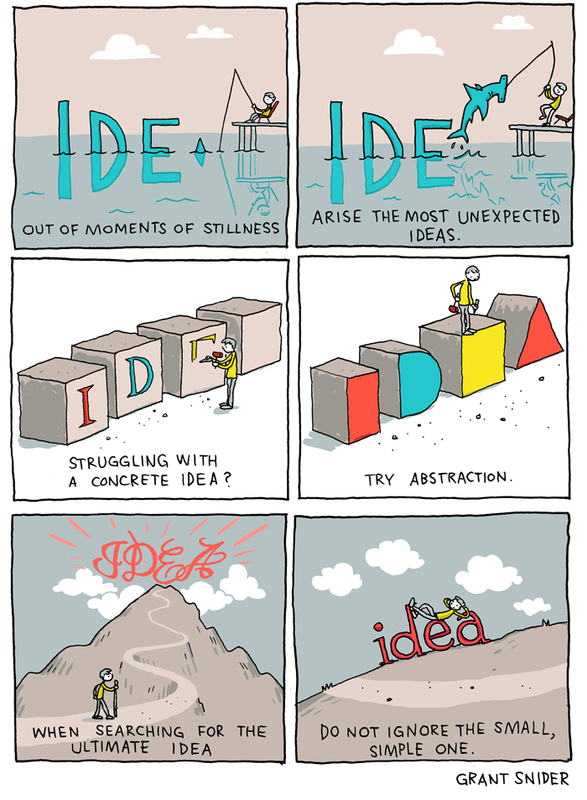 They tell a story that is simultaneously slow to develop and efficiently plotted. I say slow because I am three volumes into this series, and I still do not definitively know what is going on. However, much transpires in these stories in a short time, and I feel that each chapter unfolds in seemingly effortless fashion. Also, although the plot may tread on some material common to other scifi tales, those elements remain fresh and exciting. I genuinely want to know what happens next, and I feel like I read each of these books as if I am devouring them. The worst thing I can say about them is that I felt they read too quickly. And I want more. Now. These books are a collaboration between by Brian K. Vaughan and Cliff Chiang. They both are comics industry veterans who have won multiple awards over the course of their careers.Vaughan's many writing credits include the series Saga, Y The Last Man, Ex Machina, and Runaways, which all feature strong character work, high concept stories, and suspenseful pacing. He has accomplished much over his career, both in comics and in other media, such as when he was writer and producer of Lost. 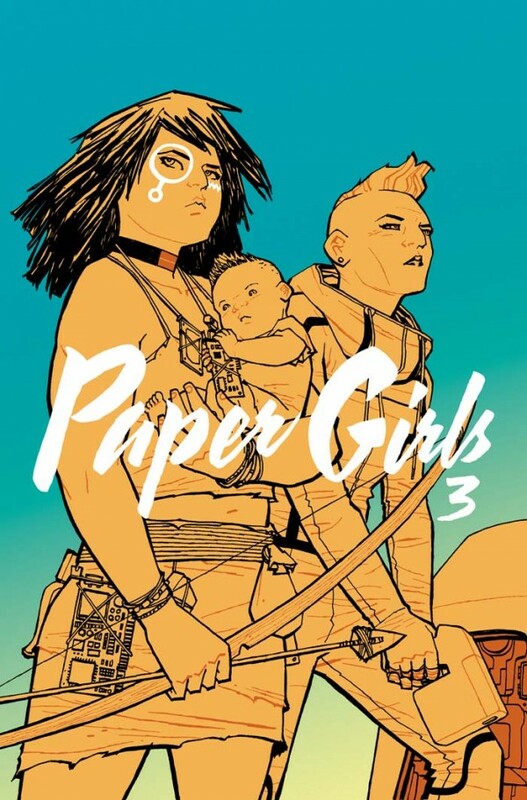 His track record of creating smart, fun, and exciting series is intact with Paper Girls. Chiang is known for his exceptional work on a number of DC Comics titles, most notably Wonder Woman and The Human Target. 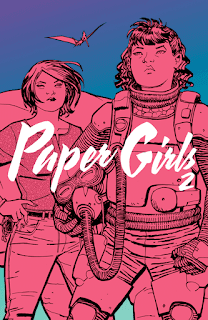 Both creators speak about their work on Paper Girls (and there are spoilers - beware) in this interview. Paper Girls won the 2016 Eisner Awards for Best New Series and Best Penciller/Inker, and all of the reviews I read of it have been positive. Thea James wrote that the second volume "continues to impress and delight." Heather Duff opined, "This series continues to be awesome, it looks good, the girls are brilliant sassy characters." Shelby Luebers called the plots "funny and curious" and also complimented that "the girls are real." 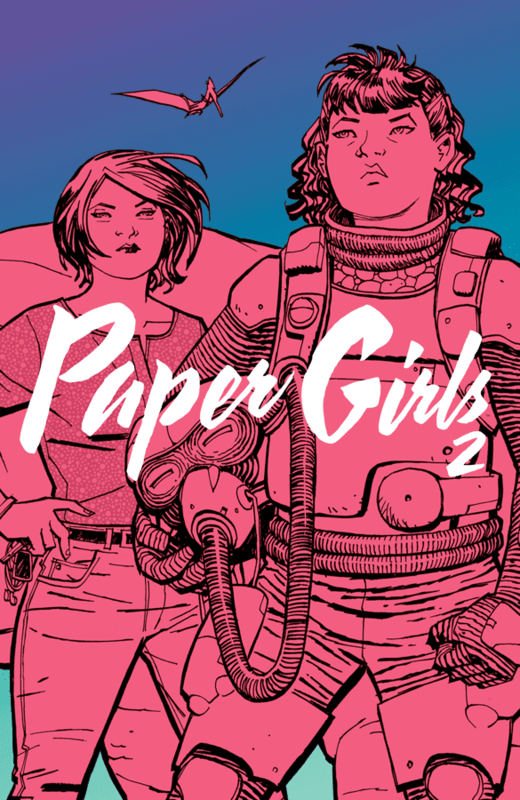 Paper Girls is published by Image Comics, and they have previews and more about the whole series here. It will resume publication in November. These books do contain a fair amount of profanity, so it is recommended for readers mature enough to handle that. My Lesbian Experience with Loneliness is a provocative title for a book that is not as titillating as it is confessional. This rare, autobiographical manga was originally published online on Pixiv, where it gained a wider readership and popularity. Although there are a couple of sexual interludes in the latter pages of the story, what it mostly entails are the ruminations and observations of a 28-year-old woman on her life and circumstances. Kabi struggles with finding herself, both in terms of her family and friends. She seeks the acceptance of her parents, though feels she falls way short of their expectations. She bounces from job to job, seeking friendship and social capital, though not really finding either. All of these situations have a crippling, debilitating effect on her, all of which she expounds on in great detail. I found this to be a very personal and revelatory book, and I feel that I learned much about her situation, more about what it feels like to come of age in Japan, and also about the business side of becoming a manga artist. Many of the events of the book are also unsettling and discomforting, but I found the whole enterprise to be fascinating and quite moving. Eventually, Kabi makes arrangements to visit a "love hotel" for a session with a female prostitute. It is a sexual scene for sure, but it is also a very emotional time that exposes many other pains, hangups, and thoughts she has. Far from being fulfilled, she is left with more questions than when she began. In all, I was shocked to see how far-ranging and introspective this book was, and it was a powerful read. 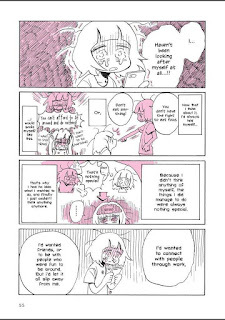 This book's creator Nagata Kabi is fairly new to the comics world, and she apparently has another manga she is working on called Solo Exchange Diary. She talks about her works and career in this interview. All of the reviews I have read about this book have been full of praise. 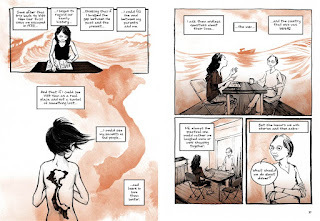 Shea and Derek from The Comics Alternative called it the apparent "manga of the year" and added, "This is a manga all about self-discovery, a diary-like account of the author’s attempts to understand herself within the context of her culture and her yearning for what she calls 'next level communication.'" Kat Overland called it "a wild ride from start to finish." Aria wrote, "I wasn’t expecting to be blown away by this – but I was." 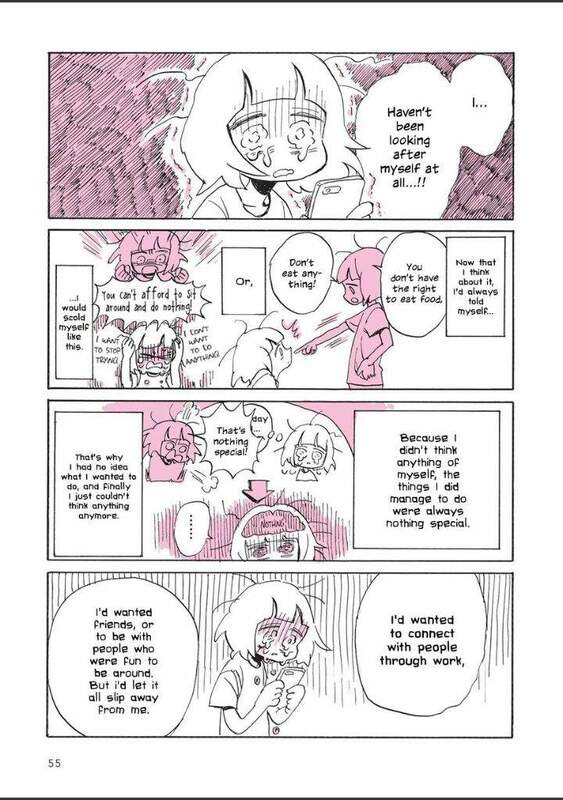 My Lesbian Experience With Loneliness was published by Seven Seas Entertainment, LLC, and they have more information about it here. As should be clear by now, this book is intended for mature readers. 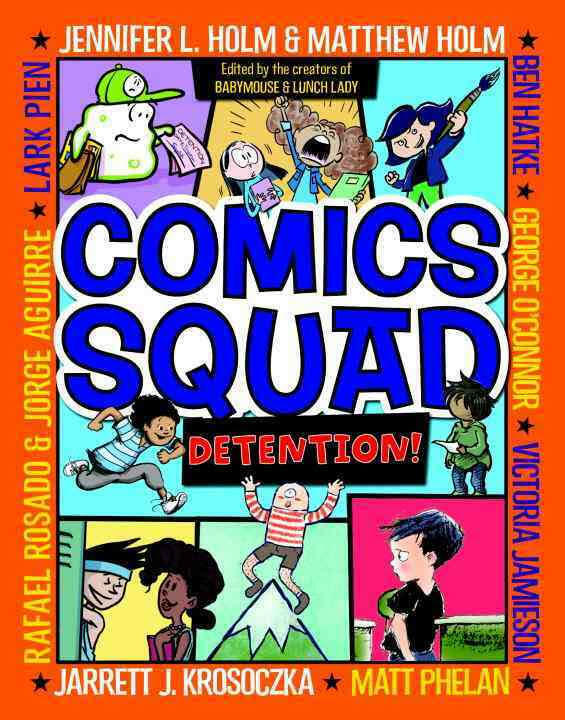 I recently read this third installment of the Comics Squad series (see my reviews for Lunch! and Recess! ), and I loved the range of stories focused on that time of day reserved for atoning for misdeeds, detention. Some of these stories seem autobiographical, some are more fictional, one recasts classic Greek mythology, and another follows some microscopic organisms. And the creators involved are some of the tops in comics, including a number of prominent award winners and best-sellers. I don't think there is one bad story in the bunch here, but I did have my favorites. Victoria Jamieson told an fun and unexpectedly touching story about a new girl in school whose unconventional detention is to help out in a kindergarten classroom. There she has a few encounters with a rambunctious and unruly student who gives her a couple of runs for her money but also teaches her something interesting. I also very much enjoyed George O'Connor's Greek mythology-infused tale of Sisyphus. It was chock full of mythological references and pad puns (two of my favorite things). The rest of the stories are mostly in the humorous vein, and some also had some inventive touches. 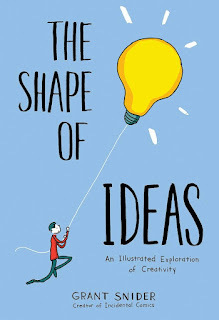 I really liked Ben Hatke's short exploration of imagination in his tale about a boy getting in trouble for having a cell phone in school and then having to invent ways to pass the time without it. I have also liked his art style, but here it is looser, which was a nice change of pace. 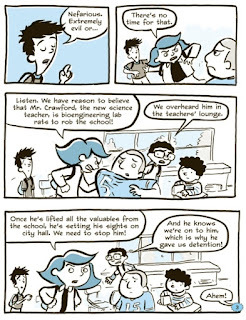 I also thought Jarrett Krosoczka's Lunch Lady comic featuring the Breakfast Bunch was thrilling and fun, though I was bummed to find out it ended on a cliffhanger. Hopefully, that story gets picked up in the next volume of this series. With all of the great things going on in this book I should also write about two things that may put people off: 1. 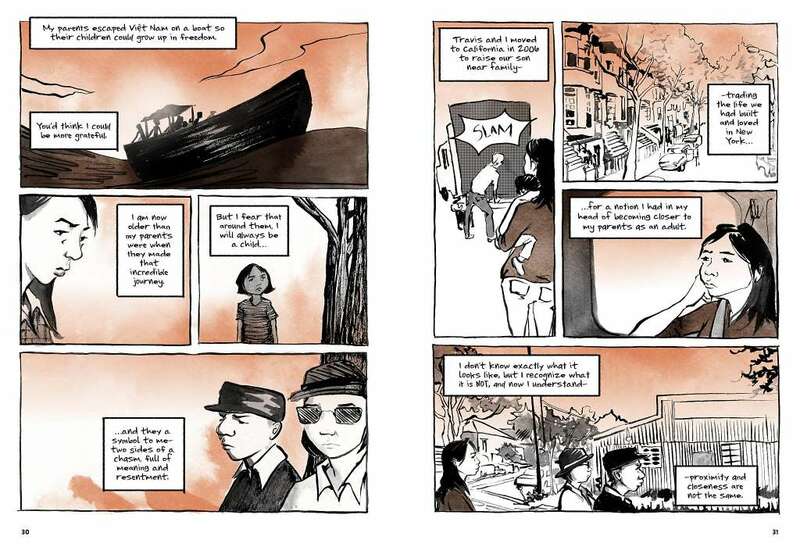 There is an agenda to sell more graphic novels to younger readers. They are clearly cross-promoting other series they publish (Lunch Lady, Babymouse, and Squish). Personally, I feel this volume would make an excellent "gateway book" to further reading, and I like much of what I have read from those particular series. So the commercial push does not bother me much, and I feel introducing readers to other tales they might like is actually one of the book's strengths. 2. 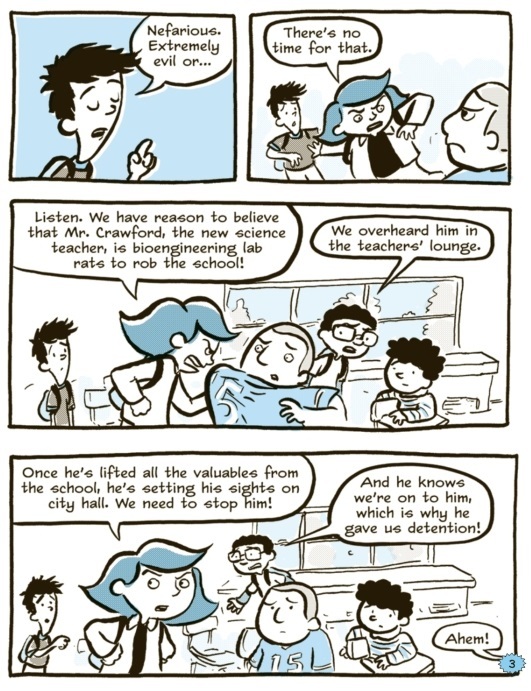 A lot of the stories share the theme of going to detention for drawing in class. 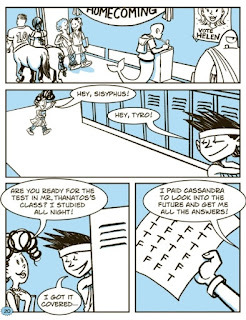 I know I had my own run-ins with teachers about when and when not to draw and can relate, but I feel like the joke gets a little stale by the end of the book. Still, I very much liked the range of tales here as well as the variety of topics and art styles. This collection is a fantastic anthology for young readers, and I think it would be an excellent classroom library book. I had a difficult time finding reviews for this book, but the one I did find, written by Heidi Grange, who stated that "all the stories are quite absurd, but thoroughly engaging and entertaining and bound to be enjoyed by many young readers." 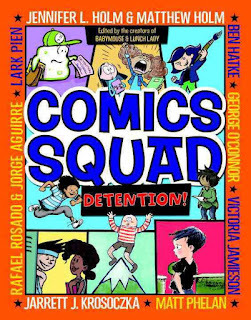 Comics Squad: Detention was published by Random House, and they have a preview and more available here.